When your husband volunteers to bake cookies you take him up on the offer. I love making cookies and it’s probably my favorite food to make. I mean it’s cookies, hello? Anyway, I didn’t mind at all when my husband said he’d like to whip up a batch (or two, hint hint). If you’re familiar with my blog then you know that he’s not a stranger to the kitchen. His specialty is making bread. He’s made every yeast bread recipe on Tina’s Chic Corner (i.e. Dave’s Bread Corner). That’s convenient since he enjoys making it and I’m afraid to. Forgive me for there being so many pictures in this post. Since my husband was in charge of baking, I was his pretty assistant. And by “assistant” I mean I sat and watched him because he had everything under control. That left me with LOTS of time to take tons of photos. Usually a lot of my effort has to go to actually making the food too. My husband was in the mood for a macadamia nut cookie. 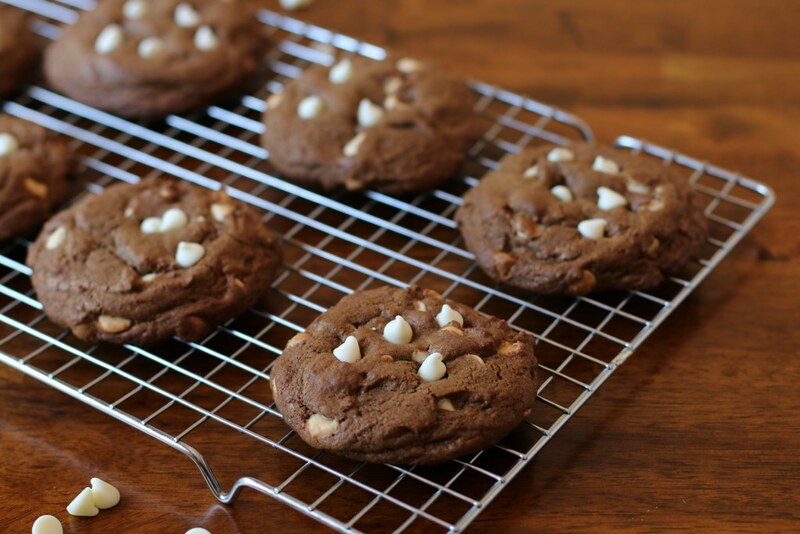 We’ve made chocolate chip macadamia nut cookies before but he wanted to switch things up a bit. 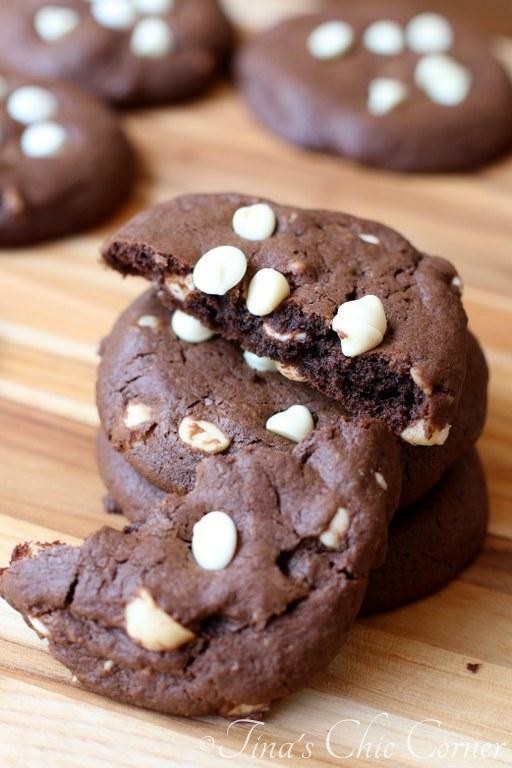 He opted for a chocolate cookie with white chocolate chips and macadamias. Look at these bad boys. 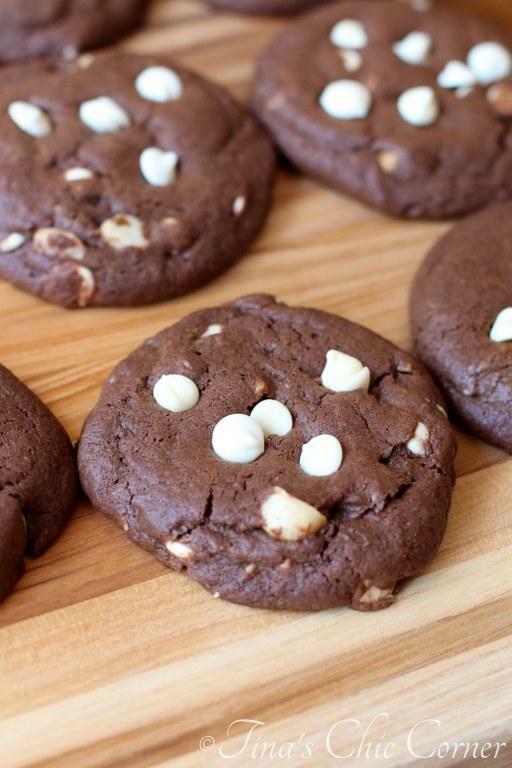 They’re a cross between a chewy cookie and a brownie. 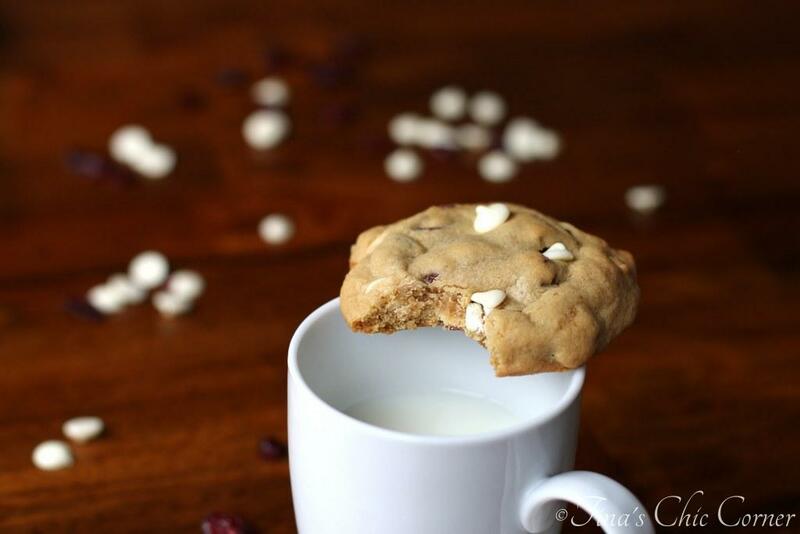 The white chocolate chips and salty nuts are an amazing taste combo with the chocolate cookie. A little secret about the salted macadamias… They were literally the only kind available in my grocery store. I suggested rinsing the salt off and my husband flat rejected the idea. Then I figured it would be a good idea to leave the salt out of the dough to compensate. He shot that one down too. In his mind, salted nuts in snack food is the way they should be and brought up both Mr. Goodbar and Goobers as examples. As it turns out, he was right. Stir in the white chocolate chips and macadamias. 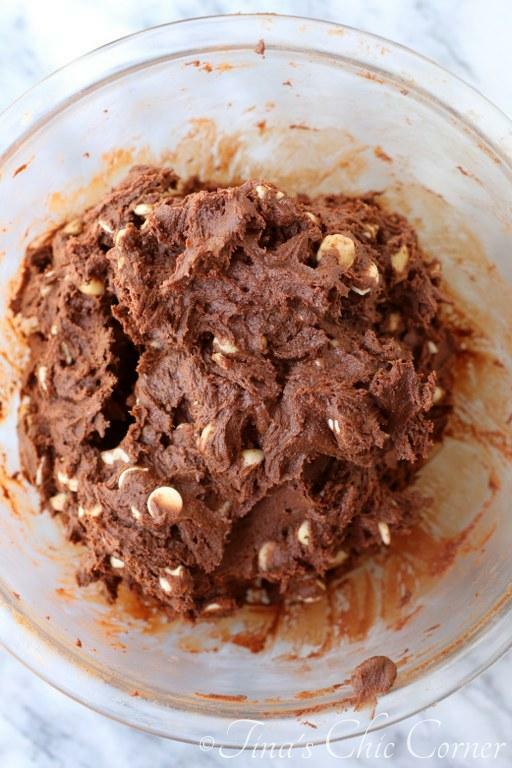 Using a 1/4 measuring cup full of dough for each cookie, scoop out dough, form into a ball, then slightly flatten it with the bottom of the measuring cup. 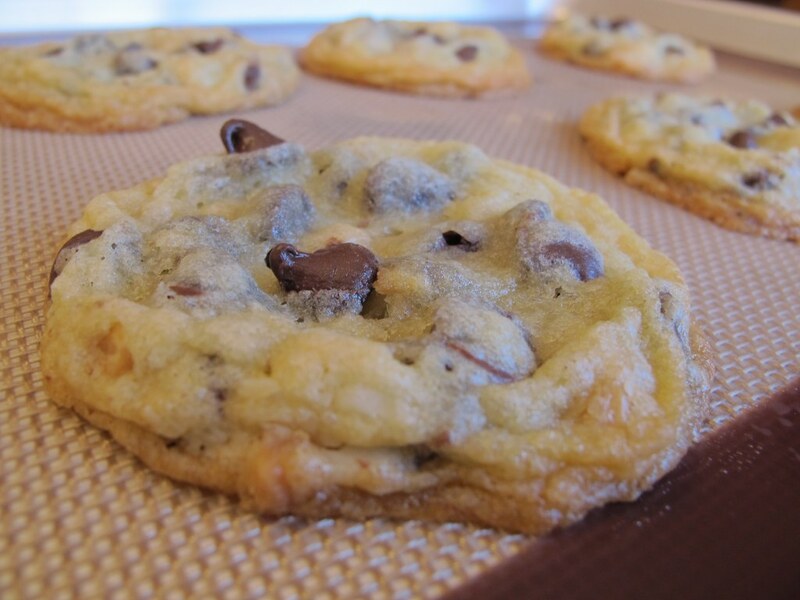 Bake them 6 to a tray in the preheated oven for about 13 minutes or until slightly browned on the edges. Let them rest for about 3 minutes and transfer them to a cooling rack. Here are some other cool cookies.